What I haven’t mentioned until now is that my favorite month to Jeep happens to be June. Yes, June — the official month that starts summer. Or, as is the case in Oregon where I live, a wildly in-between time for weather. As an example, this past Monday it was 99 degrees Fahrenheit in Portland. This Friday the high is expected to be 64 degrees! Anyway, partly because of the time of year, the fluctuating temperatures, and the fact that I’ve been cooped up all winter, I make it a point to venture out as much as possible in my vintage CJ-7 each June. Following are my top Jeep events and destinations for the month of June — loosely divided by north, south, east, and west in the United States. This list is subjective, of course. And you undoubtedly have your own favorite Jeep destinations in these regions. The point is: just get out and ride this month. There are plenty of June Jeep events to choose from! I’m taking the liberty of starting in my own backyard — that is, the great state of Oregon. Aside from my perennial favorite, the Oregon Sand Dunes (can I say it enough? ), one of my first excursions of the Jeep riding season will be to head to the Steens Mountain Management and Protection Area in the southeastern part of the state in just a few short weeks. The main reason, however, may surprise you. Although the offroading is decent, the wildflowers are in bloom there this time of year, and they’re supposed to be simply spectacular! For me, scenery ranks right up there with stellar offroad riding experiences. Although it’s in the opposite corner of the country for me, a destination area to ride that’s been on my Jeep bucket list is Killington, Vermont. A skiing mecca in the winter, this varied mountainous terrain offers multiple peaks and valleys to traverse during the month of June. The best part: many offroad trails run along the area’s myriad whitewater channels — which are products of the winter snowmelt. The combination of verdant and riparian landscape is supposed to be stellar, and it’s something that I hope to experience for myself in my Jeep someday. Moving south, an incredible outdoor playground awaits at Cape Lookout National Seashore in the Outer Banks of North Carolina. Although there are a plethora of surf and sand destinations to head to in the south in your Jeep, this area in particular is special because of its 56-mile-long stretch of beach — some of which is only accessible by ferry and then by sport utility vehicle. In addition to being able to drive on the beach (with the exception of over sand dunes, to preserve the integrity of the landscape), this national seashore offers free camping anywhere you land. If you’re a Jeep owner living in the eastern United States, there’s only one place to be in the month of June: the Bantam Jeep Heritage Festival in Butler, Pennsylvania. This annual event pays tribute to the father of all Jeeps, the history behind the vehicle, and the birthplace of the iconic SUV. The festival’s longevity — 76 years and counting — is a testament to the Jeep’s popularity and iconic status. Regardless of where you head out in your Jeep, make this month the most memorable riding month of the year. Whether you visit one of the above destinations or head out on your own, I guarantee that getting out and Jeeping this month will be good for your soul. I’m a Jeeper from Portland, Oregon. In addition to jeeps, I enjoy sustainability and environmental issues, water quality, art history, and arts education. 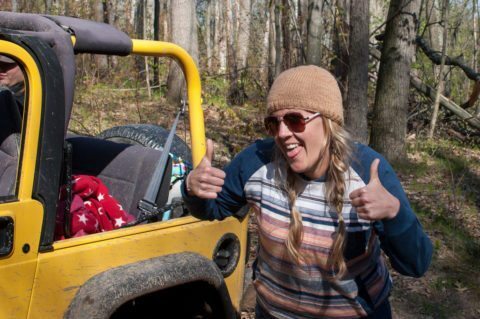 When I’m not exploring in my vintage CJ-7, I can be found trail running with my 7-year-old Golden Retriever or enjoying downtime with my 2 daughters.